First of all, thank for telling me about Goodies! I am making a trip there. Second, these flavors sound so interesting and beautiful! Thank you, Alyssa! I think you'll like Goodies - the owner is warm and helpful, and his homemade green sauce is marvelous. I always discover something new and delicious when I stop in! What can I say Hannah - you inspire me and make me want to move to Seattle (maybe even rent a room in your house!!!). I just learned something new - did not know about advieh. You always make things your own but in such a simple and yet sophisticated way. What a treasure to have you cooking with #TastingJrslm. I am dying to make the kuku and the lamb meatballs. Hopefully next week. I loved the rice! Beth, you are too kind! What a pleasure it will be when we can do some cooking together. Can't wait to share with you! Wouldn't a #TastingJrslm retreat be fun? I'll be making the rice soon. Hope you're having a good week! I've had that cookbook on my wishlist for ages, and now I'm really, really, really wanting it!! 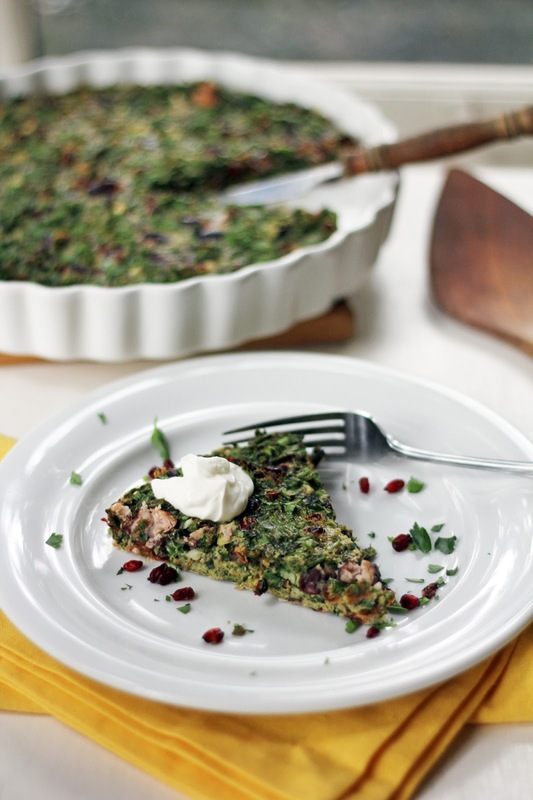 I've never come across barberries here, but I would definitely try substituting with cranberries and giving this dish a go. Love the sound of all those flavours. I especially want to try your Persian spice blend. Jerusalem is a kitchen-worthy book, Sue (it won't spend much time on the shelf...) and I hope you can dive into it soon. I think you can order barberries online if you ever want to try them, but cranberries are excellent to substitute. Hope you like the advieh, too. Enjoy your week! I've never been to Goodies, but now I'm intrigued! Thanks (as always) for my ongoing geography lessons, not to mention great recipes! My pleasure, Erina! I hope you can pop into Goodies sometime. The owner is wonderful and always suggests something new to try. His green sauce is delish, too! Hope you're having a great week! I bet the spell checker on your computer had a field day with this post! Blogging nerdiness aside, this looks just wonderful. It looks like Spring in a dish. Wow. I love Kuku, it was always on my meal rotation weekly, It's so easy and delicious. 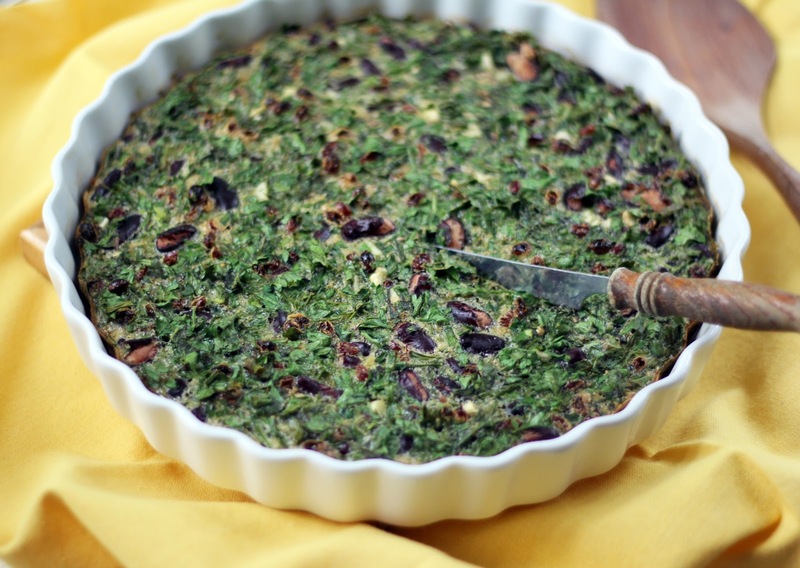 I love your recipe, I usually made Kuku sabzi but never with the kidney beans, what a wonderful addition. The zareshk or barberries are so good in this. 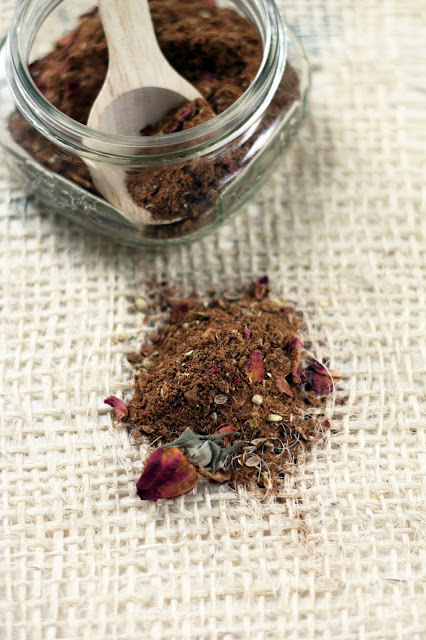 I will save your recipe for advieh, it's been a long time since I have made this spice blend and never used rose petals, I love it. I am so enjoying your journey. Thank you, Suzanne! I'm delighted you are along on this journey. 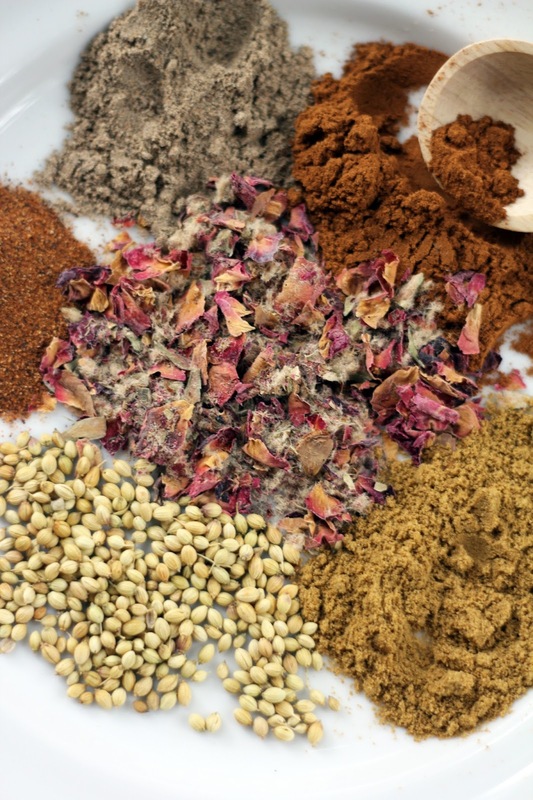 I'd love to know what mix of spices you use in your advieh - so fun to share and learn together. The barberries are terrific in the kuku. I just love their tartness. 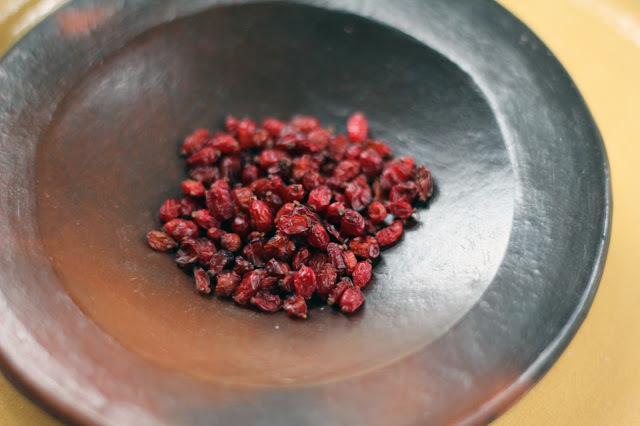 Often, dried cranberries can be a bit over-sweetened, so these little berries are a refreshing change. Enjoy your week! I can see that I'm going to have to find a Middle Eastern market. Your dish and all the dishes that everyone seems to be preparing from the Jerusalem cookbook sound wonderful...I think I need to buy the cookbook as well. Love your beautiful photos. This was a fun title to read, too! And really an interesting post. Love the flavors you're discussing - I need to find a Middle Eastern market. And buy that cookbook. Really good stuff - thanks so much. The kuku looks delicious! as does the advieh spice blend ... and so does the lamb, glad to hear it's heavenly! beautiful and colorful pictures Hannah, everything is so appetizing! Thank you so much, Orly! Cooking from Jerusalem is certainly rewarding with all the flavors, textures and colors. I'm happy we're cooking together! This looks incredible! I love the mixture of spices, herbs and flowers (and the correspondingly unique title!). I found myself engrossed for hours in their other cookbook, Plenty, and I can only imagine more hours engrossed in Jerusalem. Greatness all around! Hi Andrea! I do love Plenty and I've spent many hours immersed in it, too. Jerusalem has been no different! Recipes in both books are just loaded with fresh herbs and amazing spices...definitely a big part of their appeal. I appreciate you stopping by - happy spring to you! Thank you, Kiran! 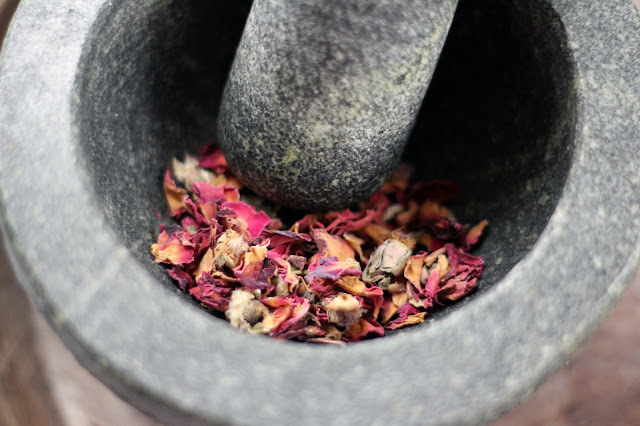 Cooking with dried roses is new to me, and I'm delighted to have discovered them. 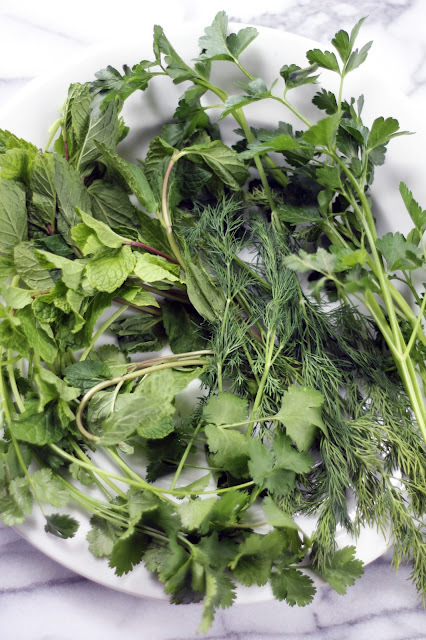 I love all the fresh herbs used in Jerusalem, too. They definitely add to the color and appeal of the dishes! It's a pleasure to share some cooking from Jerusalem! You're right, many unique flavors are in the dishes. And they're always so pretty with all the fresh herbs! I picked up some of my plates and bowls in Israel and it's fun to use them, especially when cooking from Jerusalem! I've missed so much in the last two weeks! The kuku is gorgeous - love that yours is ample on the herbs. Also have to admit, I'm intrigued by the idea of strawberries in charoset. We'll have to have a go at it. Hi Hannah, I love the kuku...I haven't made that one yet but it will most definitely be on the to do list. I am loving all the Ottolenghi that I keep bumping in to & that I am experimenting with....it has reinvigorated me a little :) I also love Persian, all those spices & rose petals add such a lovely touch of the exotic. I must go & get my mitts on some barberries...I have not yet had the pleasure. Thank you, Mairi! 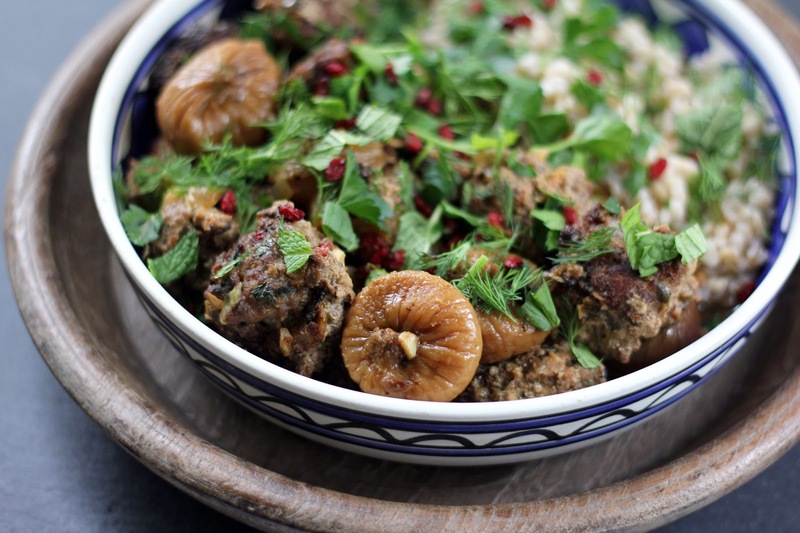 There is so much to love with Ottolenghi's recipes, isn't there? I am continually inspired. I hope you can find barberries - they are marvelously tart and fruity. And Persian flavors are always terrific!